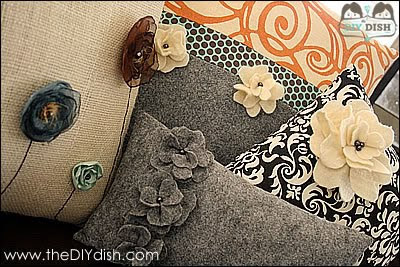 Thanks to Nancy at Linens& Laurel, I came across this great link to share with you from The DIY Dish on how to make your own cushions with flower embellishments - there's a video and stitching guide as well! Nancy has great advice re fabric: read her full post here. Click here for the full article and the downloadable pdf which has the patterns for you. 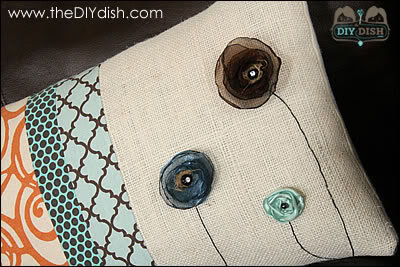 There's also a great post by Amy of Keep'n The Sunny Side on using the felt flowers for a bag. Other ideas: barettes or hair slides, headbands, brooches, tie backs for curtains. I love it. These pillows do say "Sping". I so love the flower look. They are springy and colorful and just darling. Thank you for sharing. It just tickles me so to have these patterns. I will be printing my pdf the very next thing. Some cute ideas here. Thanks for sharing! Wow! I love those. Thanks for sharing them. Awwww...thanks for the mention. I'll tell Amy, too. She is sick so maybe this will cheer her up a bit. I couldn't find my fabric which leads me right to setting up that sewing/guest room upstairs. But, first I have to...one thing leads to another, doesn't it? 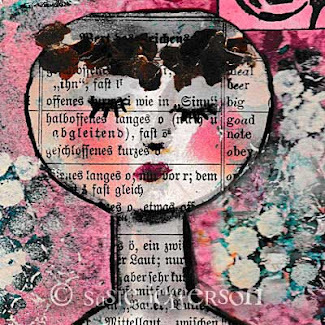 I think those of us in snowy climates are dreaming of flowers anywhere!